Bighead Moon Stories are in the tradition of classic hard science fiction. Peter Thorpe's Rocket Paintings - high quality reproductions as well as current originals - are available through the Peter Thorpe page at Novaspace Graphics. Also, Rocket Paintings are on various products at the RocketZoom Zazzle store. Upcoming stories: UFOs Over Woodstock, The Humans Next Door, Fan the Ember Moon. Aleksandr Leonov stood in his pressure suit on the lunar surface and stared at the cargo carrier in front of him. Sweat dripped from his short-cropped blond hair. His suit's cooling system fought the heat of the naked sun, the fan's whirring making it hard to hear the transmission from the salesman standing next to him. "This one is a brand new craft." he said. "A Regal V with Earth orbital capability. You may not think you need a ship that can travel that far, but as your company is expanding I suggest you consider the eventual need." Alek was a fourth generation spacecraft pilot. The family business, Leonov Transport, was known for it's safe, reliable service of moving people and cargo between its homeport of Bighead City at the Lunar north pole, to all locations on the Moon as well as both Lagrange colonies. He had recently turned 20 and completed his basic university schooling, freeing up his time to work fully for the family concern. After two years flying for Leonov, Alek's father, Yuri, offered him a partnership and announced it was time to purchase a new craft, to add to the ageing ferry they already owned. A new craft that would be Alek's responsibility. Alek's first task was to check out currently available spacecraft at Bighead City's Shipyard Sales. Plan A was to get a brand new ship, if affordable; plan B was to find a used, relatively young, one owner hauler that would cost less than a new craft. After looking at the Regal, which was very nice but a bit out of the company's price range, he inquired about used models. The salesman smiled. "Shipyard Sales has just acquired the Hollow Bell, a Bell 95 passenger/cargo rig that's only a couple of years old. The owner, Wendell Zane, a good friend of ours, recently passed away. He was of advanced age and died of heart failure, luckily while in port. He left the craft to us in his will to sell at cost for the benefit of several Lunar charities, but there is just one catch. It must be sold with its long-time occupant, a cat by the name of That That. Would you like to see the craft?" Some Bigheaders had pets, but they were rare. Alek's only experience with one was in school. A physics teacher of his had a dog he would bring to class. It was a nice enough little mixed breed. A bit too friendly at times, but not bad. And of course there were various animals at the Farms. Alek had dated a girl who worked there so he had the opportunity to see goats and chickens up close. 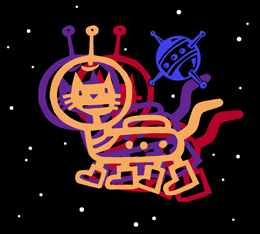 Alek was intrigued by animals and was not put off by the idea of buying a spacecraft with a resident feline. The salesman explained that the cat had to accompany the craft, and not only that, but said cat had to approve of the new owner. "How are you going to determine that?" Alek asked. "Come along and I'll show you," he said with a smile. The Hollow Bell was in great shape. It was built on the classic lunar transport shoebox shape. Propulsion was plasma engines and ion thrusters. It had a cockpit cabin with a bunk shelf right behind and above the pilot's seat. A doorway led aft into the middeck, a small but neat seating area with accompanying head and galley. Further aft was a cargo hold that could hold 10 cubic yards. All of the compartments sat on a sturdy pallet, which contained engines, fuel tanks and landing gear with in-craft access for crawl space maintenance. An airlock was situated in the starboard side of the middeck, and the hold had a rear hatch. Everything was clean. The metal and fabric bulkheads were spotless, the runner lights glowed bright. "So, where is the cat?" Alek asked having not seen one during the inspection. "Just sit down in the cockpit, and look over the controls. Give him a chance to come out and smell you. It may take a minute." Alek strapped into the pilot's seat and checked out the dashboard console, the com screens, the manual controls and the windows while he waited in anticipation. That That watched from a storage bin near the ceiling at the rear of the middeck when two humans emerged from the airlock of the spacecraft. His feline eyesight only saw the world in muted tones of blue, gray and yellow, but it was very sharp eyesight. When the humans removed their helmets, he noted that one of them was tall, with a face full of tiny dots topped by short yellow hair. He had not seen this one before. He had a nice soft voice, and moved carefully. He smelled friendly, at least from a distance. The other human, with the dark skin, smelled of spicy food. That That had seen this one on occasion before. He had come to the conclusion that 'his' human, the one who he had lived with since he was a kitten, was not coming back. Lots of time had gone by since he last saw him. And it had been a long time since the craft moved, since a time of no weight. Perhaps the new yellow haired human would take his place. As the humans moved into the cockpit, he followed. Alek was familiarizing himself with the cockpit display layout when he felt a weight land on his shoulders. Even through his EV suit, he could feel the pressure. Something wet brushed his cheek. He heard a low thrumming sound and turned to find large eyes, ringed in white, staring at him out of a gray furry face. "Hello little one," he said in the best friendly voice that he could muster. The cat smelled him for a moment, nudged his ear with his nose then flicked his tail against the back of Alek's head and jumped down, bounding slowly aft to the passenger area. It struck him as rejection, but before he could react the salesman said, "You pass." "Yes, he would not jump on your shoulders otherwise." The Yard rep explained that That That was head trained and could use it in weightlessness as well as in gravity. His food and water were delivered by automatic dispensers in the galley. He bedded in a cubby above the middeck cargo access. Keeping That That's food and water fresh was all the upkeep he would need to do. Alek commed his father and told him about the Hollow Bell. When he mentioned the cat to him, Yuri was not happy. "Papa it will be fine. The little guy and I are already friends. And the rig is in great shape." "Then I see you there, two hours. Don't get hopes up yet. Da? Spasibo." Alek passed the time inspecting the craft in more detail, checking the com, the galley and the cargo rigging. That That oversaw the activity. He followed Alek around the craft and sat next to him in the cockpit. "Are you monitoring me?" That That stared blankly at him. "Fine, be like that," Alek laughed. He turned to the control panel and started going through various commands. He checked lights, both exterior and interior, and tested the communications equipment. But a funny thing happened when he keyed the button for air circulation. When the fans came on, blasting cool air across the cabin, That That jumped up onto the consol and pawed the control screen, which stopped the air flow. He turned to Alek and put forth one low 'meowww' before jumping down and strutting aft. "Oh, so we don't like it too cold, eh?" Alek said to the retreating cat. When Yuri arrived Alek joined him for a walk around outside. His father seemed satisfied enough to proceed to the interior. They had just cycled through the airlock and removed their helmets when a gray ball of fur landed on Yuri's shoulders. Yuri stiffened, but held still long enough for the salesman to reach out and grab That That. "Oooch!" Yuri exclaimed. "Sorry sir," the rep said but Alek laughed and said, "Trust me Papa, it's a good sign." After a second tour Alek sat with his father in the cockpit. Yuri looked around and said, "So you have heart set on this boat? Did you look even at new troikas?" "Yes, but this one is in great shape and the deal is quite good." "That's because of terms. Because of cat." On cue That That entered the cabin and jumped onto the console and curled up into a ball, carefully avoiding several levers and buttons. He commenced licking his paws before rubbing them behind his ears. Yuri watched him for a minute before asking, "Why name?" "The craft or the cat?" "That's psikh!" Yuri said. "Crazy." "Seems straight to me. He's saying the cat completes the craft." "I begin to think the cat own the craft! So, you proceed with inspection and flight test. Research history. If turns out fine, then you take it foot in hand. Can go for it. The price is goot like you say. So take to finish." "Excellent. I have a good feeling about this. And I can use a co-pilot with claws," Alek said with a smile. "Be careful of wish," his father replied. That That decided he approved of the yellow haired man. Over the next few days he watched as yellowhair escorted other men in and around the ship. The older white haired man joined them and they lifted the craft off the surface and flew it in circles for some time then returned to the yard. Later yellowhair supervised the loading of cargo. After it was finished and the room pressurized That That followed him in to inspect the contents. It was a collection of large, cold containers, stacked and lashed down with thick netting. He had seen much the same before. The cold containers intrigued him, nothing else had ever felt cold like that. At one point yellowhair bedded on the shelf in the cockpit. That That jumped up and climbed in with him, snuggling up against the human. He was pleased to find himself welcome. Yellowhair stroked his back and tail. That was a very good development. In response, he slowly kneaded the man's chest through the blanket. Yellowhair did stop him there, but didn't push him out. Soon enough they were both asleep. Alek woke early the day of the Hollow Bell's first flight. His father arrived with a small plastic box that he stowed in a galley cabinet. "This," he said, "is from you Mama. Is goodie...for good luck." "You guessed yes. And none for the tovarishch, OK?" "Papa, I don't think he will want that." Yuri eyed That That who stared back at him with no sign of emotion. But when he turned away the cat jumped up on the galley counter and pawed the cabinet's release button. Yuri caught the motion. "Look! You see? The kot wants the Stroganoff!" But That That just smelled around inside the cabinet without bothering anything. "He is just curious, Papa." "I would not trust him, Aleksandr, but he is problem of yours. Good luck. You contact me after you unload on L4, there may also be more items for return trip. I have a tip from a friend in Security. Well, we will see. Tak?" "Hold on little guy, we're on our way!" That That held still, his nails gripping the back of the pilot seat. He watched out the windows over Alek's shoulder as Bighead Crater's rim descend beneath them. The sensation of gravity slowly dissipated and That That pushed himself up toward the ceiling. He did a mid-air flip, turning upside down to face aft. Alek watched him as he touched the forward window where he used his hind legs to launch himself aft through the doorway to the middeck. "Hey, the co-pilot does not have permission to leave the bridge!" he laughed. Alek pulled the craft into a high arc, heading southwest. After several minutes spent assuring systems were nominal, he broke orbit and headed toward a rendezvous with the spinning L4 space station. The trip would take just under 10 hours. After a few hours into the flight Alek heard the head flush. It startled him at first, until he remembered that That That was able to use the bathroom, even in null gravity. He must have just hit the flush button. That is one trained cat, Alek thought. He got out of his seat and floated back into the middeck. That That was flying back and forth, shooting from one bulkhead to another, twisting in the air, hitting a wall then pushing off in another direction. "What are you doing, little one?" The cat paid no attention and continued flying about for a minute before settling in his cubby compartment above the cargo access door. Alek retrieved a coffee bulb from the galley and spoke to That That while it heated. "Well, you might as well get some rest, little sputnik. We will be busy when we dock. We have a large load of ice to offload, along with some produce from the Farms. I trust you will want to supervise, so have a nice nap now." When Alek got back to the cockpit, he had a message from Yuri. "I have passenger for your return trip. She has small cargo. Name is Naomi Queen. You give her courtesy all. Also, you may want to put the little kot kot away for the duration of return flight." Put the cat away? What is that about, he wondered. Had his father mentioned that the cargo involved a cage, he might have had a better idea. That That used his sharp claws to cling to the bridge ceiling fabric as the Hollow Bell approached L4. As long as he kept away from the controls, Alek was fine with him being there. They slowly approached a docking berth along the north axis of the colony, close to the peak. "You have been here before, yes, little one? I expect you to be on your best behavior." That That kept silent as they swung around and reversed into the docking ring. The cargo hatch locked on with a jolt, and the craft shook as a tight seal was made with the station. Before Alek could properly stop the engines, That That dropped down to the console and pushed off of it, hitting the cargo hatch open button in doing so. "Hey!" Alek shouted, "Where are you going?" He keyed the camera feed from the middeck and watched as the cat flew straight through the cabin, into the cargo hold, and out the airlock. Alek cursed, did a quick shut down, and then unbuckled. He spun up and around and pushed off the windows, flying aft through the compartments and out into the dock. Several workers stopped what they were doing when he cried out, "Anybody see a flying cat?" "Over here!" Alek saw a large man floating by a bulkhead of suit lockers. That That was on his shoulders. "Oh thank heavens," cried Alek. "You must be the new owner of the Hollow Bell. I'm Smitty. That That and I are old friends." He opened one of the lockers and dug around in it for a moment, before pulling out a snack bar. He broke a chunk off of one end and tossed it up. That That pushed off after it, snagging it mid-air. "The little creature always likes his treat when he visits." "I can see that. And thank God, too. I though I'd lost him." "Oh don't worry. As long as you have the Hollow Bell you'll have him. Did you know Wendell Zane?" "No, unfortunately not. He seemed like a good man. Kept a clean ship. And then there's That That," Alek said with a nod to the cat. "Funny name. Any idea about that?" "Wendell was a writer in his spare time. I asked him about the name once. I think he said it came from Shakespeare. Something like that. Or that it had to do with writing. Wendell lost his wife in an accident about 10 years ago. They were constantly together, she always ran cargo with him. It really got him down when she died. Finally he got a cat. That That filled the void." "My father, Yuri Leonov, was not too happy about buying a used transport that came with a cat, but I like the little guy. So I convinced him that it was a good thing, at least for me. I like animals anyway." "So you are Yuri's boy? I know him. A gruff fellow, but I always thought his bark was worse that his bite." Alek had to think about that for a moment. "Oh yes, I see what you mean. Well, he's old school. Old school Russian in fact." "Yes, and he's a good guy," Smitty said. "Always decent to the dockers here. So, we're ready to unload you. Then it won't take long to load your return cargo." He swept his arm over the crates floating snug under netting in the dock space. "My father also arranged for a passenger...a Naomi Queen. Seen anything of her?" Smitty's smile faded. "You're transporting Ms. Queen? That's, ah, interesting. I'll let you know when she gets here. Better put That That away in your bunk with some more treats. Here, take the rest of this bar." Alek thanked Smitty and said, "Why put the cat away?" "If Ms. Queen has her usual cargo...well, you'll see." Back in the cockpit of the Hollow Bell, Alek took a cue from Smitty and enticed That That to make himself comfortable in the bunk by bribing him with food. Specifically Beef Stroganoff. He put a small portion of the sticky food onto a plate and fixed the plate onto the bulkhead in the bunk cubby. While the cat was licking it Alek pulled the bunk door closed. He had just gotten himself settled into his chair to check on systems when he heard a woman's voice from the middeck. "Put it in here," she said, "and tie it down securely." No, cargo goes in the hold, Alek said to himself, as he floated aft. A pale skinned middle-aged woman dressed in black turned to him as he entered and said, "You must be the younger Leonov. Your father can't speak English very well. I hope you know who I am." But Alek was distracted by the cage that Smitty was tying down next to the passenger chairs. In it was a large, snarling dog. "Perhaps you can't speak English as well?" "Ah, Ms. Naomi Queen? I'm sorry, but all cargo goes in the hold." Smitty smiled at him from behind the cage. "Wrong. Rottweilers are not cargo. Rex is a Lunar Security Dog, and you will show him respect. He will require a bulb of fresh water right away and I expect you to feed him once we undock." Naomi looked at the galley and saw the opened container of Stroganoff on the counter. Pointing to it she said, "That will do nicely." "Ms. Queen, you are paying a cargo fee. I can allow the cage to stay in the middeck, but it is not for me to feed your dog. The flight is only 10 hours, I'm sure he will be fine." "Wrong again. If you want Lunar Security business then you will do as I say." "Well, good luck," put in Smitty as he made his way back to the hold. "I'll get the rest of your cargo loaded and let you know when I'm finished." Alek gave him a helpless look, which Smitty returned with a half-hearted smile. "Mr. Leonov, are you listening to me?" Naomi snapped. "Yes," Alek said, returning his attention to her. "I will need to consult with my father as to business matters. Please make yourself comfortable." She scowled at him while she clung to the top of Rex's cage. "What kind of crazy woman have you put on me?" Alek glared at his father's image on the control console in the cockpit. "Uspokoit'sya! She is courier for Security. Good client for us. We need." "But Papa, she has a laika with her in a cage. She insists it ride in the middeck. She wants me to feed it Mama's Stroganoff!" "She sometimes transport new security dogs trained on Earth. You must spoil her, Aleksandr. Is only a few hours to Luna. I have desire a security contract for long time. So keep the sputnik away and just do." Alek looked over his shoulder at the panel to the bunk in the cockpit. It was pulled tight. "OK Papa," he said. "I will try to do this. But we will talk more when I get home." Alek returned to the middeck to find Naomi searching through the bins next to the head. "May I help you, Maam?" "Your father told you to listen to me." It was a statement, not a question. "So, you will now get me two blankets for Rex. I'm sure your piloting will be terrible and I want him to be as comfortable as possible. Put the blankets in his cage and then help me strap in." Alek took out two blankets and floated over to the cage. Naomi was on the floor, putting the opened container of the rest of the stroganoff into the cage through a small door for food and water. The magnetic strips on the bottom of the container clicked onto the side of the cage. Rex sniffed the food for a moment then turned his nose up. Naomi seemed not to notice as she moved away. Alek drifted forward. Rex stared at him through blood shot eyes and started to growl. As Alek reached for the latch to the cage the dog snarled. As he slowly lifted the latch Rex lunged, bouncing off the inside top of the cage while scrambling with his claws at the wire mesh sides. "You are and idiot!" Naomi yelled at Alek. She grabbed the blankets from him, unlatched the cage door and pushed the blankets in. Rex immediately started chewing on one. "Thank you," was all that Alek could manage to say. He moved to help her back into her seat but she waved him away. "I can do this! Go pilot if you can, I do not wish to be late to Luna." Back in the cockpit Alek went through his pre-flight checklist, said his good bye to Smitty over the com, and deftly eased the Hollow Bell away from the station. At a safe distance he pitched the craft over, rolled 90 degrees to port and with a jab to the control console kicked in the main engines. A sharp bark came from the mid-deck followed by loud curse from Naomi. "Sorry!" yelled Alek. "Still getting used to the controls." But he said it with a smile on his face. The craft settled into its trajectory and after several hours of monitoring the Hollow Bell's systems, updating the transport report, eating a snack and scanning com channels for general news, Alek unbuckled and headed back to the head. Naomi was asleep, a blanket pulled up over her face. The bright lights must have disturbed her. Rex was asleep too, partially wound in the blankets in his cage. Alek reached the head, eased himself into the chamber and closed the door. No noise came from the cabin and he relaxed. He grabbed a sponge and squeezed warm sudsy water into it. He removed his shirt and rubbed the sponge over his neck, arms and chest. It felt so good he decided to pull his shoes and pants off to do a full rub down. It wouldn't take long and he needed it. That That woke from his nap in the sleep cubby and stretched. It was dark in the cubicle and smelled of the tasty food that yellowhair had brought to him earlier. Some more of that would hit the spot, but the plate, attached to the bulkhead, was licked clean. Then he realized there was another smell, faint and musty, in the air. He turned to the air vent and sniffed. Yes, there it was. A smell he had not encountered on the craft before. It was the smell of another animal. That That was not happy about that. The door to the sleep unit was closed but he knew how to open it. He flipped up, releasing his claws from the bedding and landing on the bulkhead next to the door. His rear claws dug into the cushioned wall as he put his fore paws on the door handle. With a good deal of effort he pushed hard and the door slowly slid open. Now the musty smell was stronger. He pushed out into the cockpit, turned and landed his feet on the forward window, pushed again and sailed back into the middeck. The first thing he saw was a woman wrapped in a blanket sleeping in one of the padded chairs. Then he saw it. Next to the chair, fastened to the floor, was a cage with a dog in it. The dog was wrapped loosely in a blanket, a section of which was gripped in its teeth. It was sleeping. And next to the dog, attached to the inside of the cage, was a container with the rest of the tasty food. That That was definitely not happy about that. He launched off of the doorframe and landed softly in front of the cage on the carpeted floor, gripping it with his nails. The cage had a latch that looked easy enough to move. He placed a paw next to it and pushed slowly. With little effort it slid enough for the cage door to swing out slightly. With a pull the door opened fully and That That eased in toward the container of food. But just as he reached it the dog stirred, sniffed and opened its eyes. Alek was sitting on the head when he heard a loud clang followed by Rex barking like mad. He pulled up his briefs, the only thing he was wearing, and drew back the cubicle's door. He saw several things at once. Ms. Queen, who was yelling for Alek, struggled with her harness, her head wrapped in her blanket. Meanwhile, a gray ball of fluff shot aft into the air with an angry Rottweiler in close pursuit. Alek gasped as Naomi threw her hands up in front of her. "What is happening? What is going on?" she yelled. Alek ignored her and pushed off after That That, who had ducked into his cubby over the door to the cargo hold. He made it there before the dog. He grabbed the top edge of doorframe and swung up to shield the cubby. Unimpressed, Rex clamped his jaws down on Alek's briefs and started chewing them. Naomi, finally free from her seat and blanket, swiveled around to see Rex pull Alek's briefs fully off. "Oh my God!" she screamed. "Ms. Queen, please...Help!" Alek begged as he kicked out at the dog, connecting with its breastbone. "Rex! Heel! Now!" The dog shot backward, the remnants of Alek's shorts in his jaws. With no surface close enough to grab on to, Rex could do nothing but scramble in mid-air. Alek pushed off in the direction of the head, one hand covering his privates. He tumbled in, pivoted around, stuck his head out and yelled, "Get your dog in its cage!" He watched as Naomi snagged Rex from the air, pulling him down to the floor. Only then did he slam the head door close and quickly pull on his clothes. When he emerged from the head Naomi was struggling with the dog, who had no intention of getting back into its cage. Out of the corner of his eye Alek caught sight of That That dropping down toward the cargo door control pad. With a swipe of his paw it slid open, then he quickly returned to his cubby. Rex, meanwhile, caught sight of That That over Naomi's shoulder and pushed off past her. His aim may have been for the cat, but he found himself spiraling through the cargo door into the hold. Naomi rotated around and flew after him. That That watched everything from above. Alek, flying after them, made a quick decision and stopped himself at the door. With a triumphant snicker he hit the close door button, then locked it. He watched through the door's porthole as Naomi grabbed Rex and wrestled him to a stop. She looked up and locked eyes on Alek. Alek, without looking above him, said, "That That, she did not see you, did she?" Naomi, thinking he was talking to her, pointed at her ear and mouthed, "I can't hear you!" Alek hit the intercom button and cleared his throat. "Ms. Queen," he began, "I see that you do not believe in keeping your dog's cage latched. Why did he get out? What happened?" "He heard you in the bathroom, you moron! This is all your fault!" "No, it is your fault for not putting his cage in the cargo hold in the first place! I'm afraid I cannot allow him back in the middeck." "You are going to leave us in here?" "It is comfortable and safe. Luna is only an hour away. I cannot allow him forward. If he were to get into the cockpit and disturb anything..."
"I will have Security on you for this!" "No it is I who will be reporting you to Security for demanding that unsafe cargo ride in the passenger cabin. My father wants the best relationship possible with Security, and I am sure they will appreciate our efforts at safety." Naomi floated up to the port and banged on it. "You can't do this! I demand you let us in!" "Tell it to Security after we land," he said before cutting the intercom and turning to push off toward the cockpit. As he launched he whispered, "Little sputnik, keep out of sight!" Security was on hand to meet the Hollow Bell after it landed at Bighead Port. They took delivery of one security dog, and delivered a citation to Naomi Queen. A citation that Alek knew meant very little. But at least she was out of his hair. Alek explained the situation to Yuri over com as the rest of the cargo was unloaded. "Papa, Ms. Queen was very careless. She left the dog's cage unlatched and it got out. Caused all kinds of trouble. I had to put them in the hold. Sorry if we do not get the courier contract." "It is no matter, Aleksandr. I talk with Security after I talk you. They say Ms. Queen some times a problem. Is my fault I set on you. We will no worry this one more. All rest is fine?" "Yes, Papa. The Hollow Bell performed perfectly. She is a lovely vessel. Are you coming out?" "Yes, I have meeting at port. Want me to bring you supper?" "No, Papa, not for me. But for That That, bring caviar!" © 2002 - 2019 Peter Thorpe. All rights reserved.